A good, basic motel, offering large pleasant rooms with bay windows, located on the Marina’s “Motel Row.” It isn’t beautiful, but it’s functional and reliable. All rooms are no-smoking, and parking is complimentary. A minimum stay may apply on some weekends. This standard 1960s motel is handy for the Castro, the Lower Haight, and the Mission. It’s one of those no-frills, what-you-see-is-what-you-get places, simple and very serviceable, and quiet, given its prime location. Free parking is a plus, and cable TV, too. Vaguely English Tudor in style, with a slate roof, the rooms are comfortable and fairly large, and a few have bay windows. The location is convenient to the Marina and Pacific Heights. Free parking, cable TV, and in-room coffee maker. All no-smoking. Larger-than-average rooms. Floral wallpaper and traditional furniture give it a homey feel. Some suites have Oriental carpets accenting wood floors, marble fireplaces, and antiques. Free parking and a no-smoking floor. The charm of a San Francisco Victorian awaits you here. The marble lobby is the focal point of this four-story hotel built in 1924, and the sitting room is the setting for Continental breakfasts. After a day’s sightseeing, return to the inn for afternoon sherry. North Beach’s biggest bargain is full of charms. 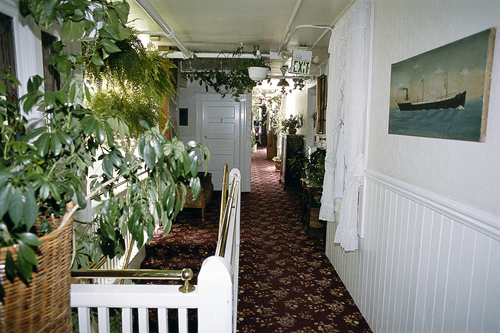 Each room is decorated with antiques, and the corridors feature brass railings and hanging plants under skylights. Every room has its own sink, while other facilities are down the hall. Action-central for all the major sights. Rooms hold up to five beds. All major public transportation is just outside. Nightly movies, e-mail access, walking tours, an events board, and lots of tourist info are other pluses. On a wooded hilltop, this hostel is housed in Civil War-era buildings. It’s just a short walk to everything along the Bayshore. The center has six comfortable, quiet rooms available for those who are interested in learning about Zen practices. Nearby are the Muir Woods, and great beaches. Located close to Union Square and public transport, this modern apartment block includes amenities such as a swimming pool, sauna, concierge, dry cleaning service, fitness center, and business center. The furnished and serviced apartments can be rented for a minimum of 30 days. Furnished apartments are available in several locations around town, with a 30-day minimum stay. This company provides all the comforts of home, with the added amenities of a hotel. Every apartment has a fully equipped kitchen. All utilities are included, as well as local phone calls, cable TV, and maid service. 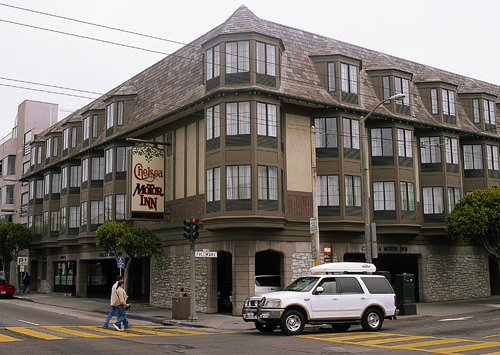 An all-suite hotel on Nob Hill. The renovated rooms offer kitchens including refrigerators and microwave. There are housekeeping services, voice mail, cable TV, valet service (nominal fee), and laundry service. Edward II Apartment Suites are across the street from the Edward II Inn, near the yacht harbor. Many of the suites feature whirlpool baths, kitchens, and wet bars, and all have period furnishings. Convenient to Downtown. Each room has a private telephone connected to a 24-hour switchboard. Maid service and towel exchange provided weekly. There are also a laundromat and TV viewing rooms, plus a games area. All guests have use of the ice machine, refrigerator, and tea and hot chocolate. A short walk to Downtown, the furnished studios and executive apartments boast superb views and are available for a minimum of 30 days. All rooms include fully equipped kitchens, internet access and cable TV. A San Francisco Victorian built in 1906. Amid the mansions of Pacific Heights, the Monroe combines the best features of a hotel and an apartment. Included in the price are American-style breakfasts and four-course dinners. Maid service is also provided. All homes participating in the service have been carefully selected. Private residences in every desirable part of San Francisco are listed, including Pacific Heights and the Marina. Home exchangers simply trade their homes at a time that is convenient to both parties. This home exchange agency provides web access to members worldwide who exchange their homes for short and long-term stays.